I love the soft colors in the picture, and isn't that afghan a work of art? 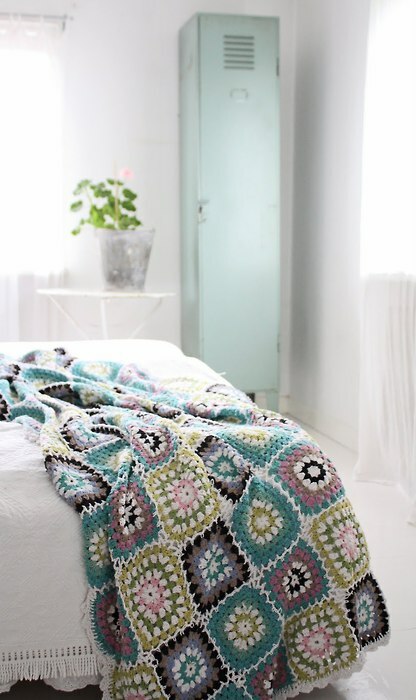 I don't have experience with crocheting or knitting, but the pieced afghan reminds me of a quilt (which I have done). 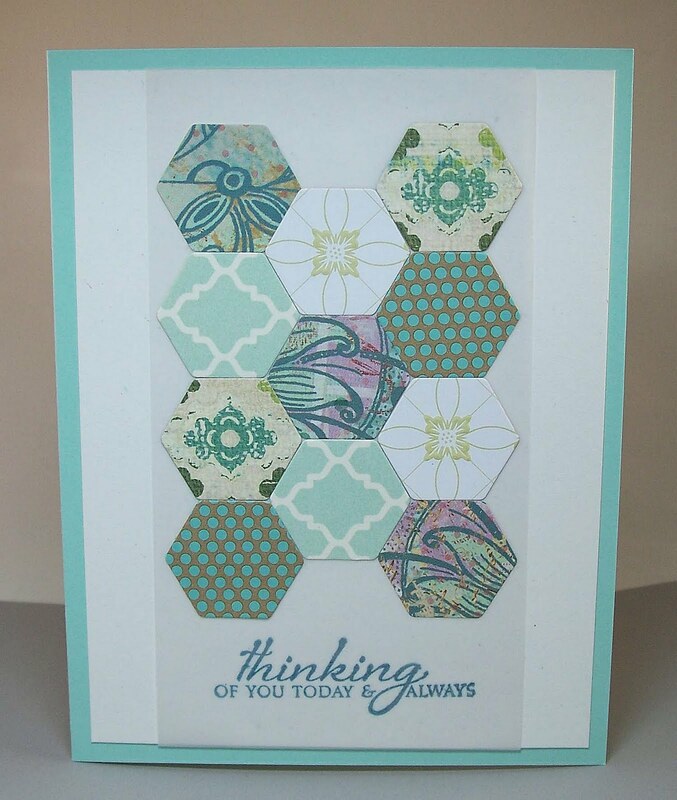 So for my card, I did kind of a honeycomb quilt pattern. I'm absolutely obsessed with hexagons and honeycomb style quilts are some of my favorite. I love they way they are vintage and modern all at once. So the pieces of my "quilt" are made from 5 different patterned papers. Ever since I got my hexagon dies, I've had this card in my head. 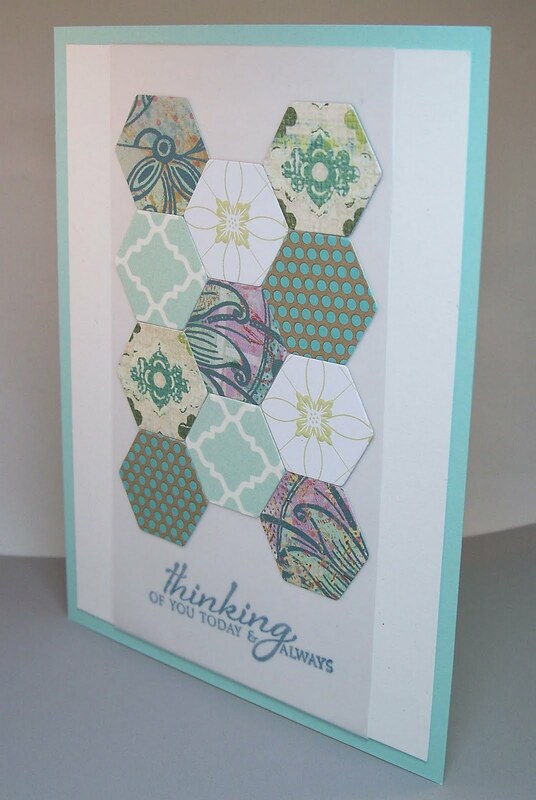 To mimic the soft look of the inspiration image, I pieced the hexagons on a layer of vellum. The entire piece of vellum is layered over the card base including the sentiment. And a side note...this is the first time I used my new vellum adhesive runner. I was a bit skeptical at first, so I tried it out on some scrap vellum. It works perfectly! On my card, I put the adhesive over the sentiment so the vellum would really stay close to the cardstock. The adhesive is virtually undetectable even in person. Now I'm off to go peek at all the wonderful other Moxie Fab cards! Thanks for looking! This is beautiful and a wonderful idea! Gorgeous card design!! Truly fabuulous!! Just beautiful! Thanks for the vellum adhesive tip, too! Wow, JJ! This is a fantastic card! So beautiful. I love the idea of using the vellum that way, and the patterned papers are just wonderful. Thanks for popping over to my blog, I really appreciate your visit. I love this!!! The colours, the patterns, the fantastic layout framing the pretty sentiment, the softness of the vellum... gorgeousness! 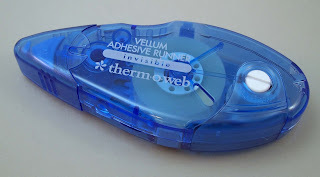 Awesome news about the adhesive - I'm gun-shy since I've bought so many vellum adhesives that didn't work that way.